Like rivals Nikon’s consumer grade DSLRs follow a regular annual upgrade cycle, although, contrary to years past, the models they replace are kept in the range posing something of a dilemma for potential purchasers. Announced at the beginning of the year the D3300 is the latest re-imagined entry-level model replacing the 24-Mpix D3200. At first sight the two are remarkably similar in specification – both are built around a 24-Mpix APS-C CMOS sensor in a small lightweight and relatively low-cost body. The D3300, however, differs subtly from its familiar looking predecessor by the inclusion of a more powerful Expeed 4 level processor with a higher maximum ISO setting up from ISO 6,400 to ISO 12,800 (with a ISO 25,600 extended option) as well as a faster burst rate, up to 5 fps from 4 fps. Video features have also been upgraded with the D3300 adding full HD video at higher 60/50 fps for slow-motion footage to the D3200’s 24fps and 25/30 fps options. There are one or two other minor modifications but of course the D3300 differs in one very significant feature – the 24-Mpix sensor now lacks an AA filter – the removal of which promises to improve detail rendition. Potentially that closes any gap in resolution between the entry-level D3300 and the maker’s semi-pro grade D7100, a model that retails at around $500 more body only. 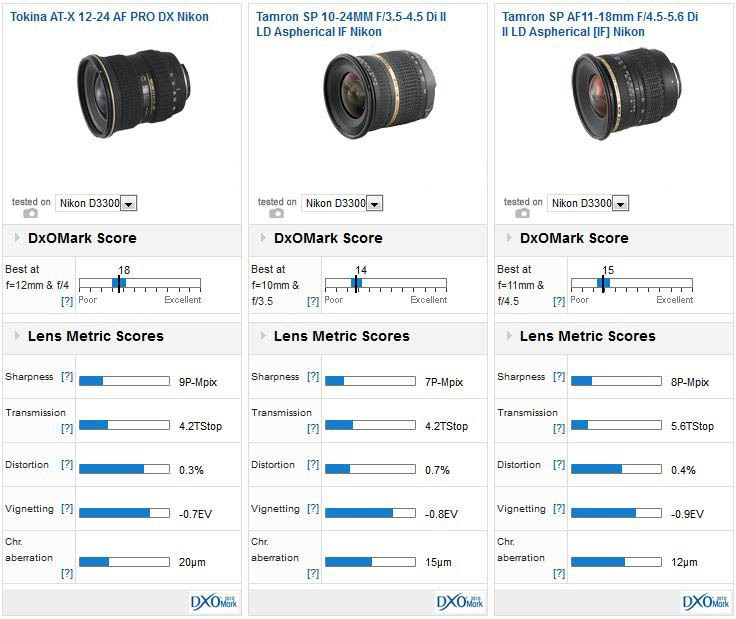 Although this makes the D3300 a tempting B-camera for imaging professionals, we’ve tailored this roundup to appeal to the firm’s intended market, yet we’ve included the results of all of the best-performing lenses tested (in tabulated form at least) so that readers can make their own judgments using our comparison tools. 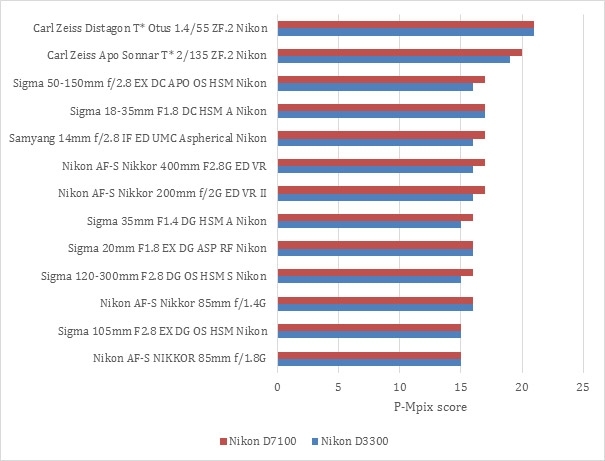 DxOMark have carefully analyzed the optical performance of over 140 models on the Nikon D5300, from both Nikon and third-party lens makers, including popular models such as the ultra-wide DX format Sigma 8-16mm f4.5-5.6 DC HSM (12-24mm equivalent), Nikon AF-S Nikkor 10-24mm f3.5-4.5G ED (16-35mm equivalent) and the cryptically named Tokina 116 ATX Pro (11-16mm f2.8). 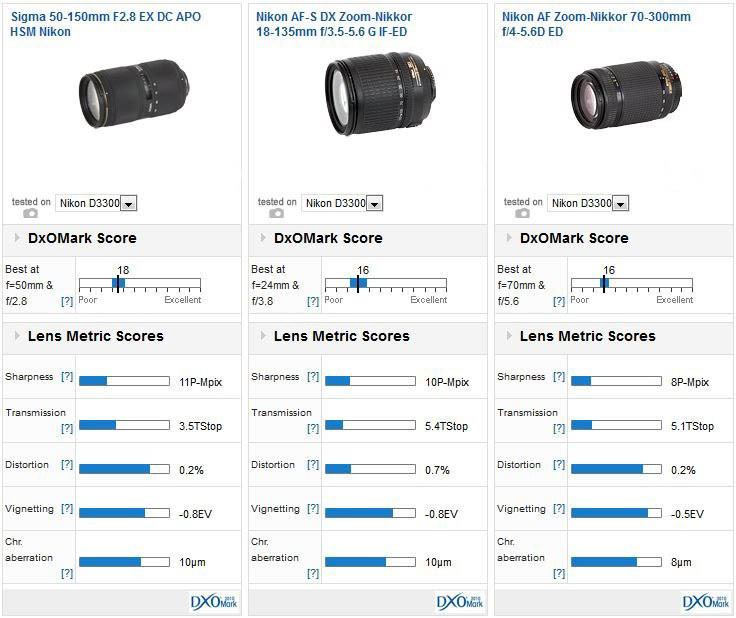 New models assessed include the new high-speed Sigma 18-35mm f1.8 DC HSM A and the full-frame Nikon AF-S Nikkor 80-400mm f4.5-5.6G ED VR, which is the equivalent to a 120-600mm as well as the recently revised Nikon AF-S Nikkor 18-140mm f3.5-5.6G ED VR. We’ve also added the data from the upgraded Sigma 30mm f1.4 DC HSM, and Samyang’s high-speed but manual focus only 24mm f1.4 (35mm equivalent) and 16mm f1.4 (24mm equiv) primes. Although the Nikon D3300 has a similar 24-Mpix APS-C CMOS sensor to the Nikon D7100, Nikon consumer models have no option to output 14-bit lossless compressed Raw files only 12-bit compressed. While this and other slight modifications in the imaging chain account for the slender lead in sharpness between the two models when used with certain lenses, the differences are negligible in reality. 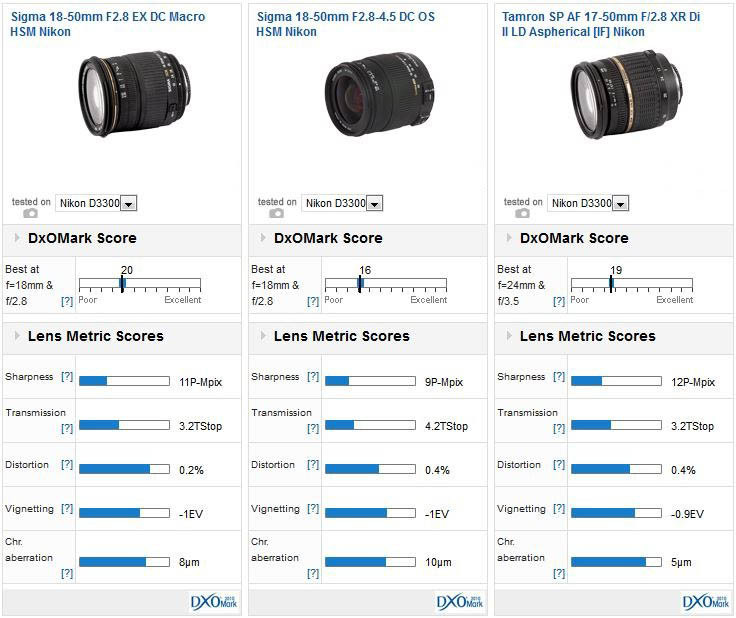 The best performing zoom model in our database is the new high-speed Sigma 18-35mm f1.8 (28-54mm). It boasts a sonic type AF motor and a of course a high-speed constant aperture but some detractors cite the shortish range of focal lengths and lack of stabilization and yet, at $799, it’s probably slightly at odds with the intended user base. Sigma is also ranked in second place for their recently revised stabilized 50-150mm (70-200mm equivalent) f2.8 zoom. Again, it’s targeting enthusiasts but this and the 18-35mm could be all you need, particularly if you intend to add a D7100 at a later date. Full-frame lenses take several places after that, all of which have their merits but models such as the Sigma 18-50mm f2.8 and Tokina 116 AT-X Pro stand out as good performers. In North America and Europe, the Nikon D3300 is available with the new recently revised 18-55mm f3.5-5.6G VR II retractable zoom, but as an option to that moderate speed model, third-party makers Sigma and Tamron offer some intriguing alternatives. The two Sigma 18-50mm models have recently been replaced by new 17-50mm and 17-70mm models but if they can still be found on dealer’s shelves there could be a bargain to be had. The 18-50mm f2.8 is a particularly good performer though the Tamron 17-50mm f2.8 is still current, performs similarly and costs just under $500, compared with $569 or thereabouts for the newer Sigma. Sigma’s revamping of the lens range has resulted, understandably, in some price hikes and that applies to the revised 50-150mm f2.8, though the old model, if it can still be found, is a good performer. Our original listing indicates a sub-$500 price but that was at launch, even secondhand they’re quite sought after. Much lighter, smaller and more discrete the 18-135mm (28-200mm equivalent) is a good all-rounder. Although recently revamped as an 18-140mm model this 2006 model is sharp at the wide end, typically it’s not such a good performer at the longer focal lengths. In first place, perhaps not surprisingly is the ultra-wide Nikon AF-S 14-24mm zoom. As a full-frame FX format model it’s a large and heavy lens, and a $2,000 it’s quite an investment and clearly targeting imaging professionals. In second place is the original Tokina AT-X 116 Pro DX, a favorite of professionals and enthusiasts alike both for stills and video, thanks to the constant f2.8 aperture. Although superseded by a revised DX II version, the older model can still be found at retailers for around $450, around $75 less than the newer model. In third place is rival Sigma’s equivalent. For around the same price, this model is two-thirds of a stop slower but that’s not the case in practice (transmissions varies somewhat) and it has a wider range of focal lengths making it, arguably the more versatile. Our value choices include the Tokina AT-X 12-24mm (18-36mm equivalent) Pro DX, another model that is currently in transition with a new revised (and as yet un-tested) model, the AT-X 12-28mm Pro DX. Currently at $399 the AT-X 12-24 Pro DX is some $90 less than the new model and yet placed fourth in our rankings, it has good image quality. Sharpness levels don’t quite match the firm’s ATX-116 Pro DX or revised DX II model but it’s a great performer even if CA is on the high side. In second place is the now discontinued Tamron SP 11-18mm f4.5-5.6 which maybe worth hunting down secondhand. If that doesn’t appeal, then the SP 10-24mm (16-36mm equivalent) f3.5-5.6 Di II first introduced in 2008 is still available at $499 and is a good performer if the wider field of view appeals over the Tokina. In part II of this guide, we’ll be looking at the best performing primes and recommending budget options. 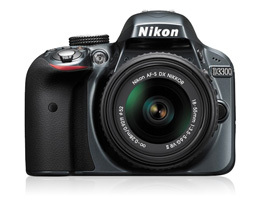 If you have a Nikon D3300 and a favourite lens, we would very much like to hear from you. Please leave a comment below, stating what lens it is and why you like it.